Above: This suave gentleman features in the video (click to enlarge). He is Captain Preston, who married the younger Grimshawe sister, Genevieve, in 1891. 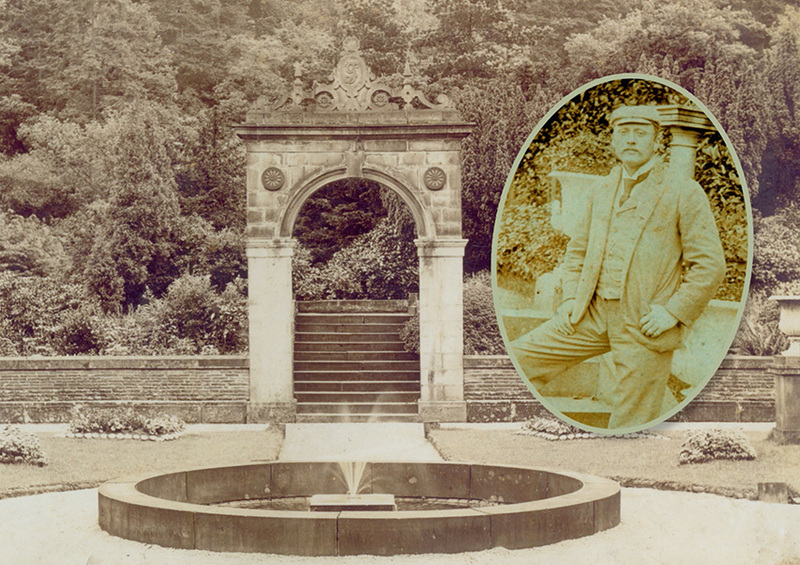 He’s pictured on the steps leading up to the family’s hill-top cemetery – which is where he now lies. It’s taken a while, but I’ve finally managed to complete a short, 12-minute video showing how the construction of the twin reservoirs completely changed the landscape of this part of the Goyt Valley. This video focuses on the area around the hamlet of Goyt’s Bridge, which now lies submerged beneath the waters of Errwood Reservoir. I’m planning to do another on the landscape lost beneath Fernilee Reservoir, including the gunpowder factory, in a later video. To view this video in all its high-definition glory, simply click the image to play, and then the expand symbol at bottom right of the screen. It features some of the old photos of both Goyt’s Bridge and Errwood Hall that people have kindly allowed me to scan and publish on this website, and to plot their position on old maps. I’ve also tried to recreate a flavour of life in the valley during the time the Grimshawe family lived at Errwood Hall, including local children pictured outside the small one-room school, as well as visitors taking tea in the farmhouse cafes in Goyt’s Bridge. I hope you enjoy viewing it as much as I did making it. Any comments – as well as suggestions for future videos – would be much appreciated. We have been visiting the Goyt Valley for a number of years and enjoy the stunning views that the area has to offer, especially around Errwood Hall. I have reviewed the reasoning for the demolition of the hall which seems to have been associated with the development of the reservoir. However when you look at the location of the hall and it’s immediate surroundings it is difficult to understand why the scheme required its removal. Is there any more info on the reasoning for its demolition? Seems such a waste! I’ve just revisited Errwood Hall six years after first exploring the remains. I have much enjoyed learning more from your website and the video is truly excellent. Professional and highly evocative it makes a great watch. Well done! Thanks once again for the depth of your research.